Clearly, I’m a bit late to the party but honestly, this is the first kale salad I’ve ever made! And lately, I’ve been into curly kale. Curly kale has lived in the shadow of its sleek-looking sister (cavolo nero) for years. And I get it- I’ve never been a fan of curly kale myself. It reminds me of those typical garnishes at chain restaurants or giant cabbages people plant in their front yard as part of their autumnal landscaping. And because of that, I’ve never been inclined to eat it. But there it was at the market: a beautiful bunch of curly leaves freshly sprayed with water. This recipe is a riff on my Curried Quinoa & Asparagus Salad. Marinate the kale in lemony, ginger-curry vinaigrette; the acidity tenderizes the leaves. Don’t be afraid to give it the full spa treatment too. Get in there with your hands and gently massage the leaves. Sounds so silly, but it really softens up the kale. I could use something like this, actually. The rest of assembly is easy: quickly shred tart green apple, carrots, and purple cabbage in the food processor. It takes 2 minutes. Then, toss with crunchy things like pepitas and pomegranate seeds. Believe it or not, my pomegranate seeds were unearthed from the freezer. So vibrant and pretty… When unavailable, simply leave them out. Add leftover cooked quinoa for a hit of protein and chewy raisins. This salad is perfect for lunch or to enjoy after a good work out (chasing small children, or otherwise). It can be made in advance too. What kind of kale do you like? This salad can be prepared and chilled, up to 3 hours. The ginger-curry vinaigrette can be made up to 3 days in advance and stored in an air-tight container in the fridge. Add avocado right before serving to preserve freshness. PS- there’s 1 Hass avocado in this recipe (not pictured) for essential creaminess. Try this vinaigrette drizzled over grilled fish, such as tuna, halibut or salmon- it’s delicious. If you don’t like kale, or curly kale for that matter, substitute with baby spinach or mixed greens instead. Skip the marinating part in the instructions below. To make the vinaigrette, add all of the ingredients to a food processor. Blitz to combine. Season with salt and pepper. Pour your dressing into a bowl or container for easy storage. Unplug the machine and fit with the shredder attachment (no need to clean it out). Add the kale leaves to a salad bowl. Pour some of the dressing on top. Get in there with your hands and gently massage the leaves; the acidity from the dressing will tenderize the kale. Let it sit for about 15 minutes to marinate. Meanwhile, shred the carrots, apple, and cabbage in the food processor. Add to the kale. Add the leftover cooked quinoa and avocado. Mix gently to combine. When ready to serve, sprinkle with pepitas, raisins and pomegranate seeds. Toss with extra dressing, if desired. This looks delicious. I love a good, dimensional salad. Excited to try it. This salad is speaking to me right now!! I’ve been trying to be more creative with my salads lately, because I feel like I make the same thing every day (read: kale salad with crunchy chickpeas and kimchi). And while that’s delicious, variety is the spice of life, right? ;) This salad looks like the perfect thing to mix it up. I am late to the kale trend too, Emilie! I knew about the massaging part (going forward, I’ll always think of it as a spa treatment! ), but I love your idea to marinate it in an acidic dressing, too. 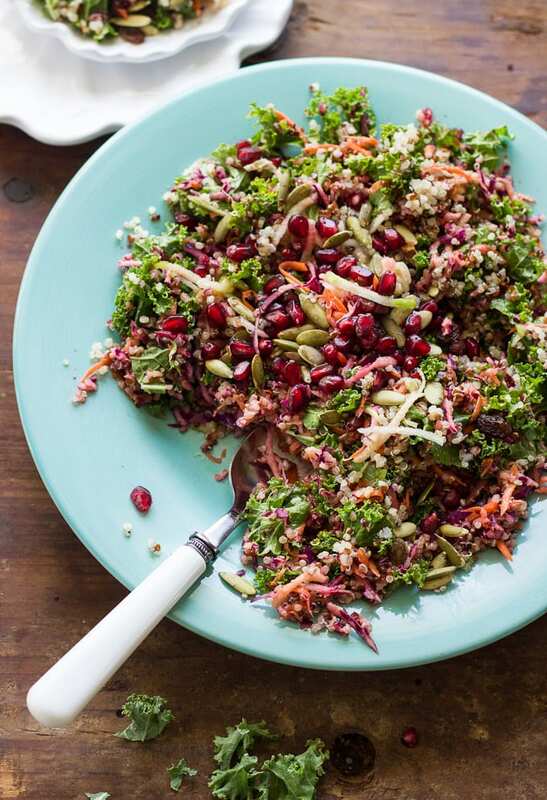 And with all those wonderfully crunchy elements and sweetness from the pomegranate and raisins, this is one amazing salad. Thanks for the inspiration!! Kale is always in my heart!! I love this and am so happy you posted a delicious salad recipe today! Well, it’s better late than never :) I love kale and this salad recipe of yours is truly inspiring. The colour is absolutely wonderful. And that vinaigrette-veggie combo is really interesting. I will never, ever tire of kale. It is my spirit vegetable. I love your kale salad. It contains some of my favorite ingredients, and I am excited t combine kale with curry, which i have never done. Hi Emilie! I’m with you…I wouldn’t have been able to walk away from the kale at the market either. Sometimes you just have to go with your “gut”! I’m such a fan of this type of salad. 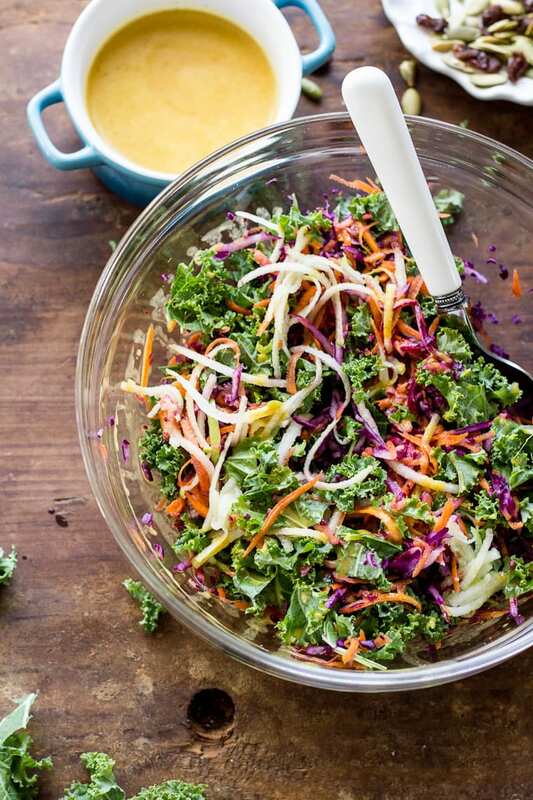 Soft marinated kale with the crunchy veggies and tang of the dressing! Mmmm…my mouth is watering! Haha… I have to agree with you on that one ;) Thank you Donna! This looks absolutely sensational! The colors are simply beautiful!